Shortly after hitting"Post" for the last story, I headed out to the Villas beach to see if I could find more banded shorebirds. 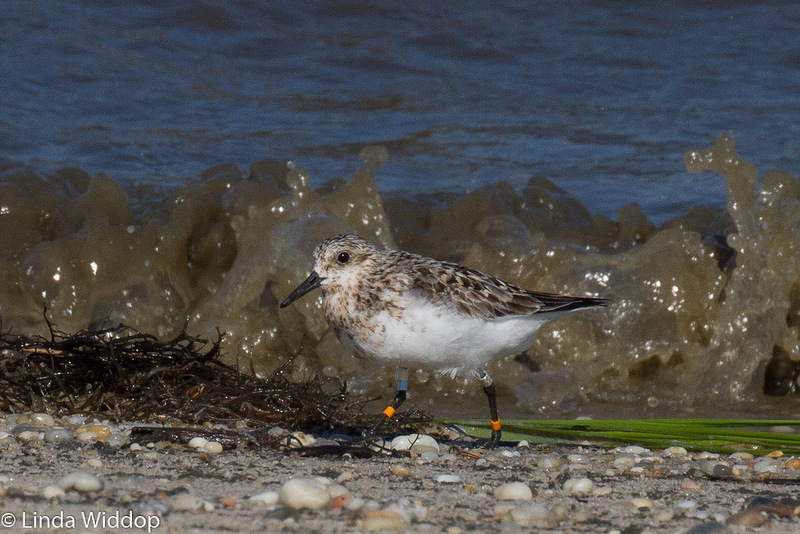 I found a few more Sanderlings with the normal light green flags with black digits. 11M and P6Y to be exact. It is neat to find information about the birds by entering the code into bandedbirds.org website. You can upload photos (which I do) and track the places where the birds have been resighted over time. Both of those birds were recently banded in NJ or DE and didn't have very much history about being resighted. The bird that really caught my attention yesterday was this Sanderling. Zoom in to see the bands on this bird. It has 5 separate bands on all parts of both legs. Ridiculous! I wonder how this bird gets around with all of that bling. You know, I'm not much of a FaceBook person. I am not sure why people need to know what I ate for lunch or "Like" a photo of me doing anything at all. That being said, I am on FaceBook because birding things are posted there and sometimes nowhere else. I also like the birding groups such as the DVOC group and the ABA group. I also found a group called "I Heart Shorebirds" (the word heart is actually a heart icon). A few of the members helped me track down info on this bejeweled bird. The bird was banded at Lake Chaplin in Saskatchewan Canada sometime between 2012 and 2014. The scientist in charge was contacted and said that they did not do individual color codes or flag codes as part of that study but would love to have my sighting posted (which I did). Of course, I had to look up Lake Chaplin Saskatchewan. Here is a map. It would take 32 hours to drive there from the Villas NJ - a distance of 2,062 miles. Imagine that this little bird can fly that distance AND he is only part of the way to his winter home! I think this really drives home the importance of our own Delaware Bay to the survival of these birds. He could have taken a direct route south or gone west, but this little guy knows that our bay has horseshoe crab eggs to eat and those eggs will fuel his journey south better than any other food source. Its like people who move to Florida coming home for Cheesesteaks and TastyKakes! If you support conservation causes like I do, this is a great place to put your money and your effort. What's with this birds in a band thing? Do they play Oldies? Rock? Jazz? Do the Humming Birds hum because they don't know the words? Speaking of Hummers, they seem to be fueling up early this year. They went through a cup of nectar in three days!